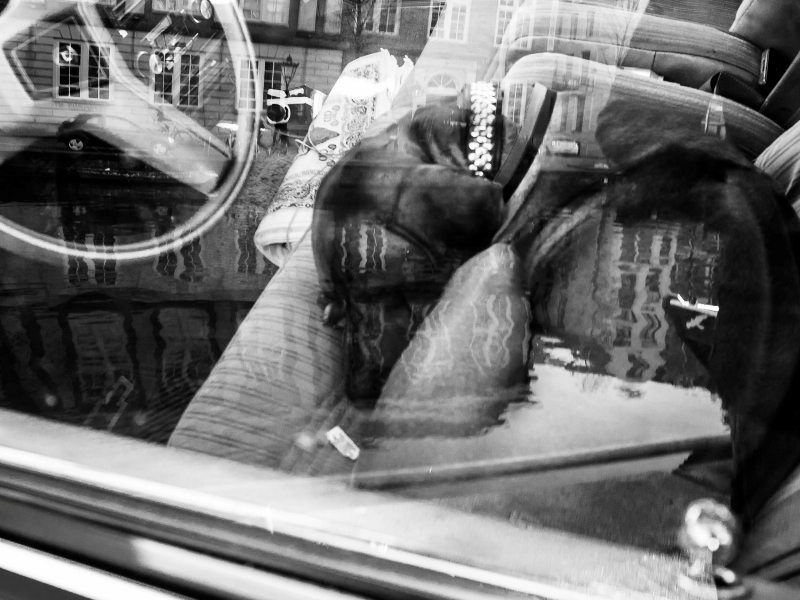 Today my guest co-host for this new episode is Dutch street photographer Fokko Muller. Fokko was our guide on Episode 15 for the Streets of the World Amsterdam special on Street Focus. Together we answer questions by Chris Payant and @streettogstore about choosing your best shots and how often we go back to a location to get the shot we envision. The winners for the last ‘Light’ Street Challenge are Levi Shand and Philippe Justel. Both will receive a book from our friends are Rocky Nook! Levi shot this image in Rome. You can see more of his work on his website. Philippe shot this image in Los Angeles. You can see more of Philippe’s work on Flickr. 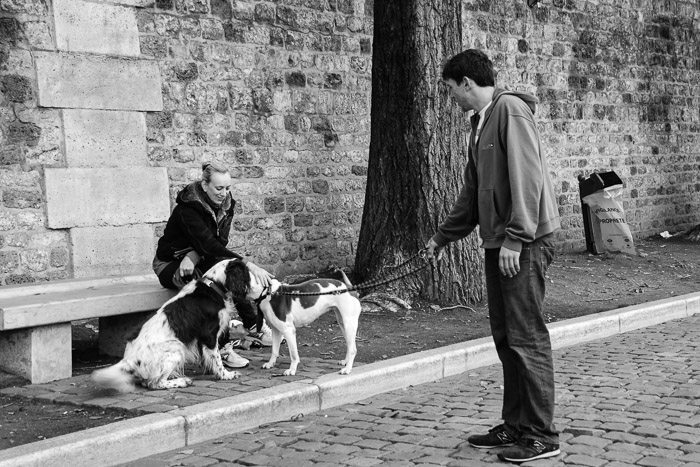 Listen to this episode to get tips from your hosts about including pets in your street photography. Then hit the streets and enter your winning shot. Please resize for the web (700 or 800 px) and limit to one entry per person. Enter in the comment section of this post. Entries close on April 30. Good luck! For inspiration: Here are a few images for inspiration with the theme of pets in the streets by Fokko Muller and Valerie Jardin. 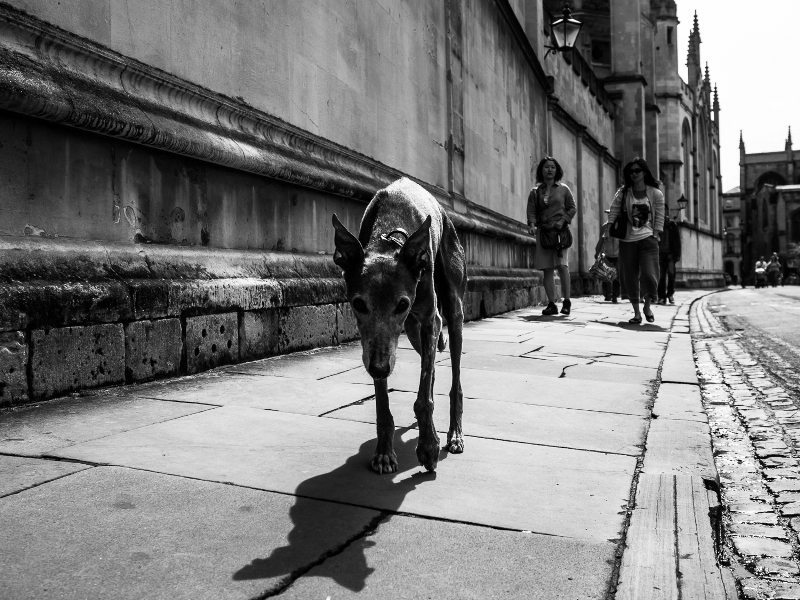 You can also see Fokko’s Street Dogs gallery and links to his book and social media presence on his website. To keep up with what Valerie is doing, see all links on her website. Great episode, and thanks to both of you for the great honor! Just wanted to drop in and try to…illuminate…how I made that image with the red umbrella in Rome. (Spoiler: I don’t exactly know!) I brought one film camera to Rome and a digital, and I didn’t touch the digital the entire time. The film camera, the one I used to take that picture, is a Contax RX with a 28mm Zeiss T* Distagon 2.8. I only brought what film I had loaded from Madrid, some Ektar 100…and that had run out the day before. Stupid me, I could not find a camera store in downtown Rome, and all of the tourist kiosks, the ones marked with Kodak signage, only sell one type of film: Kodak ColorPlus 200. Very difficult to find anything else, and 200 seems a bit slow for a dark and rainy day. I opened the lens all the way and dropped the shutter speed to 250, or 125, and was still underexposing by a good amount. This guy walked by rather close to me, with his red umbrella, and I had a Saul Leiter flashback and snapped a shot. If you look closely enough, it is slightly out of focus. There are other shots on the roll that turned out as dark, but I knew when I saw the bright cyan spot on the negative that something good was coming. I thought it would be interesting for you to see the original shot without retouching, below. I think the only post-processing I did was to crop out the white and black bands around the borders, and to solidify the blacks a little. As they were, they seemed a little bluish. Oh, and I dodged lightly around the man’s hands, the paper, and his face. Genuine question: how did this happen? Was it just really underexposed? There are some details visible, but only barely and they seem out of accord with the brightness of the umbrella. I’m as stumped as anyone else about it! Thanks again, guys, and Valerie, if you could share this explanation with Fokko I would greatly appreciate it. I’m happy to do it too, but I’m not sure how. Cheers! Thank you so much of ‘shedding some light’ on your beautiful image Levi. I’ll let Fokko know that you provided an explanation here. No problem Rick, noted, I can see it’s yours. Thanks for participating! Thanks Levi for your explanation. Great story for a great photo! 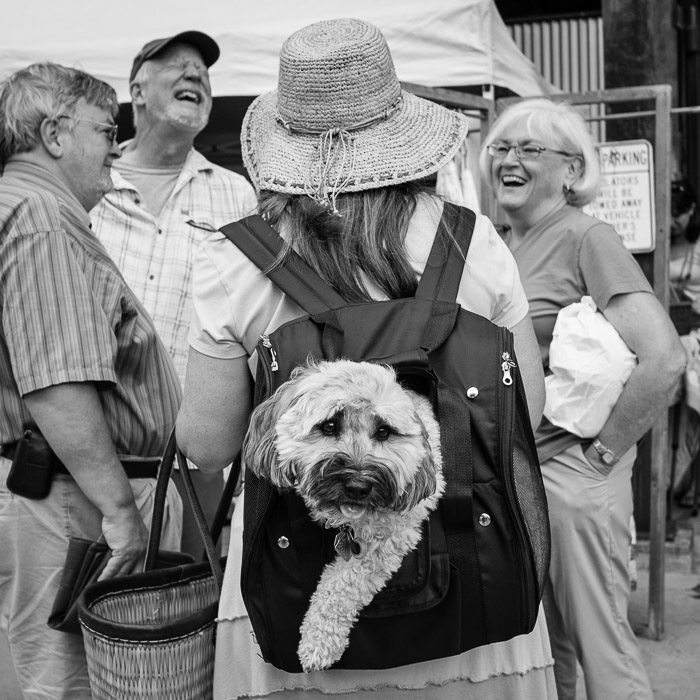 Pets in Street Photography entry – Shot in Waima, Kona, Hawai’i last month. Does on have to be a paid subscriber to TWIP in order to submit photos to the Street Focus challenge every month? 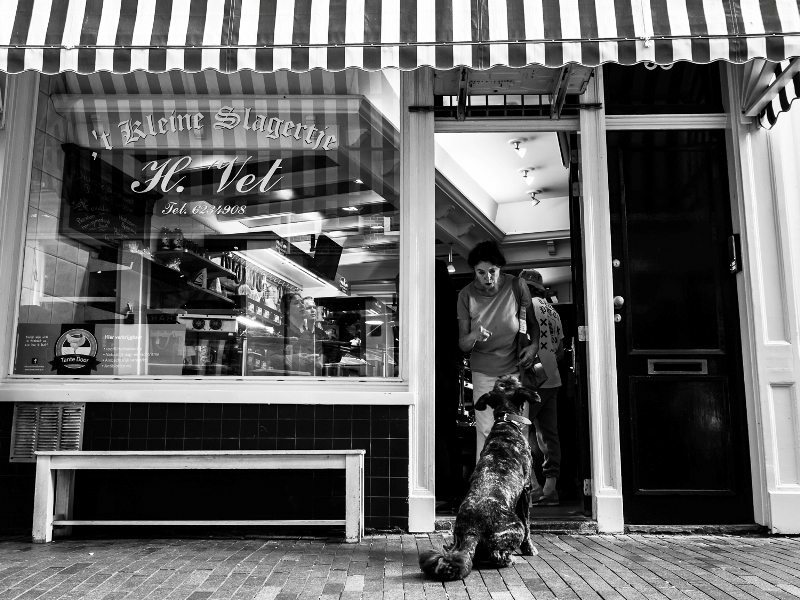 Valerie – does one have to be a paid subscriber to TWIP in order to submit photos to the Street Focus challenge every month? No, everything here is free! 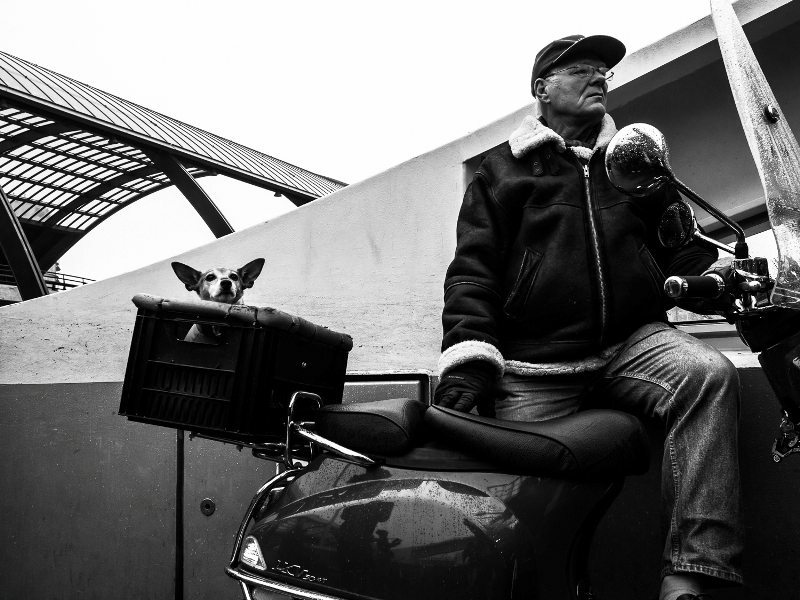 Easy Rider – I shot this photo of a Montreal motorcycle rider and his dog at a small rest area on Cape Cod. Anyone who spends time on the streets shooting has noticed that many homeless men and women have a pet or two with them. Homeless folks that I have come to know tell me that they have a pet mostly for companionship but that it also helps with the panhandling. 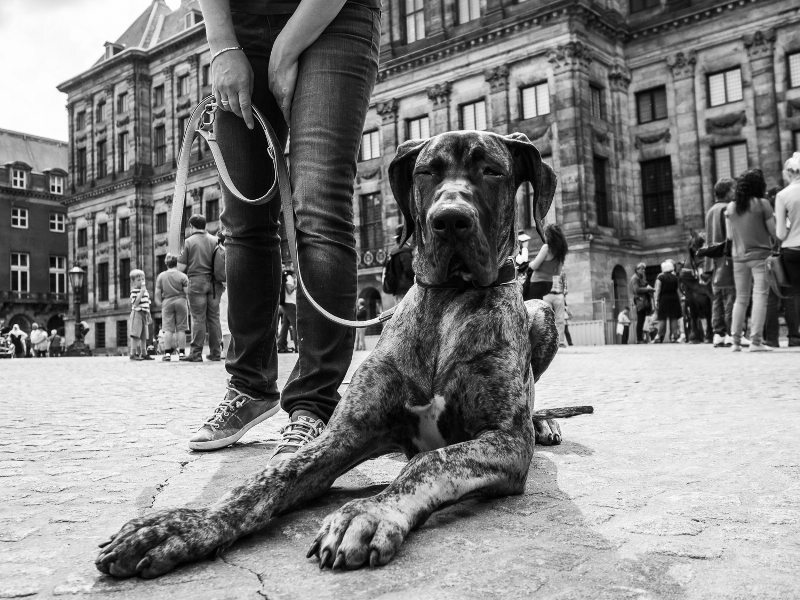 The logic being that passersby may feel more compassion for the animal than the human. Whatever works! This is one such person and his dog. Valerie is right… no charge! Its a little gritty looking because I didn’t know I had knocked the apeture to f22 and I was shooting through a window. Taken in downtown Salt Lake City outside of the City Creek Center. Processed in Topaz restyle for b&w. Shot with my Sony a6000 and 18-100 f4 lens. This shot has been taken 2006 during the Fußballweltmeisterschaft in Germany! 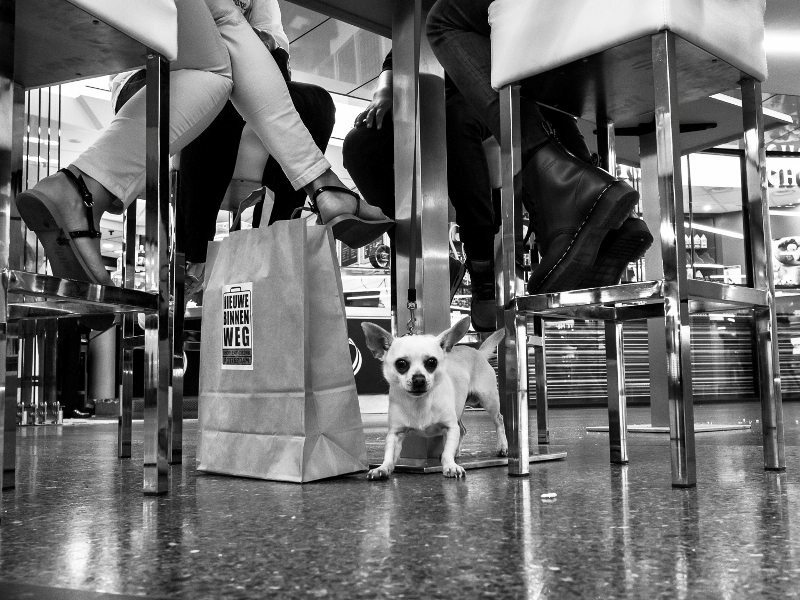 It’s part of a ‘street dogs’ series not jet published. Achim, you photo doesn’t appear with your post. I hope you try again. Maybe resized smaller? Others have found that using a different browser helped. Sorry for the inconvenience! Another wonderful show, Valerie! I have been shooting street for a year, and I am still struggling with the editing my images, so thank you especially for that part! I was out on the warmest day yet of this Spring – which also meant a lot of people out with their pets, and I remembered the challenge, so here is my submission. By far the most aggressive dogs on my walk today were the smallest ones! lol No real harm, but they were barking up a storm at everyone who was near. Thanks again for the great show! re-sized – hope it works now!? Hi, I uploaded it in a smaller size. Hope it works now? Very enjoyable episode with Fokko. Enjoyed episode 29. When I heard the subject of the new challenge, I recalled this shot from a couple of weeks ago. Yes, this one posted just fine, thank you for your patience Achim! Glad you enjoyed the show Mark, thanks for listening and participating in the challenge! Thank you for your patience with upload problems! Glad to hear you enjoyed the show Kim! Editing is a struggle for many people. Having a critique done of your work is the best way to learn and to make stronger images the next time your go out. This dog was being SO bad! 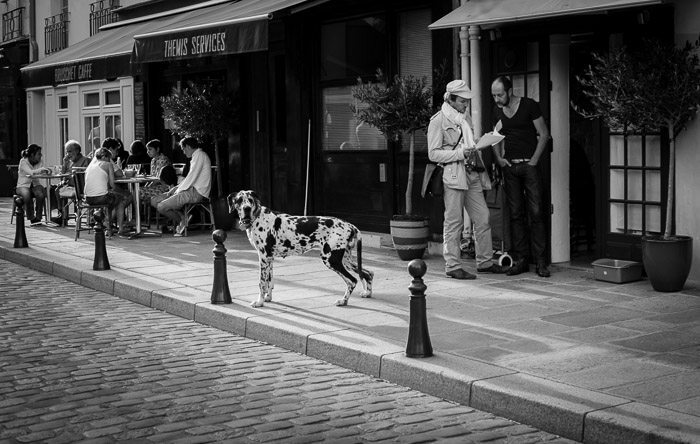 Paris, 2014. This guy was hamming it up for my friend’s camera. Big man, little dog. South Beach, Miami Beach, FL. Walking to be seen. South Beach, Miami Beach, FL. This little guy tried to steal my lunch! San Mateo, CA. This puppy could not take his eye off me. Snapped the photo rather quickly. I only just managed to listen to this episode today, great chat with Fokko! So here’s my dog pic if it’s not too late. I took this in Benidorm a couple of years ago with my Sony NEX3, I only had a couple of seconds to get up from my seat and capture the shot but I’m glad I got it. Hope you enjoy it too. “Southie Doge” Seen in South Boston, MA. 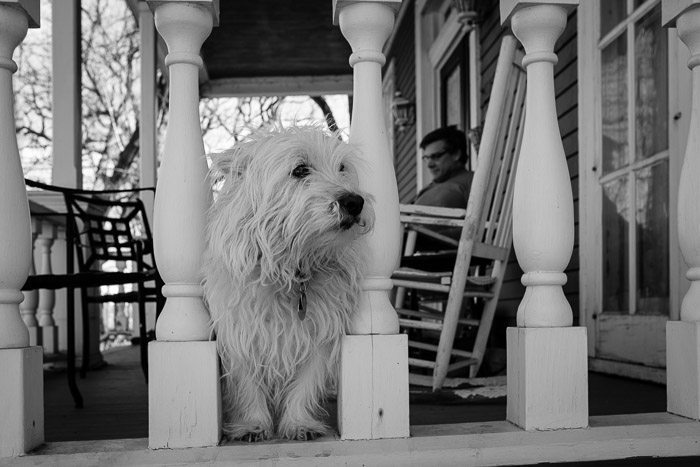 Photograph by Dan Bullman, 2015. Here is a wonderful a moment i had the chance to capture. This dog was spreading smiles on all faces around. 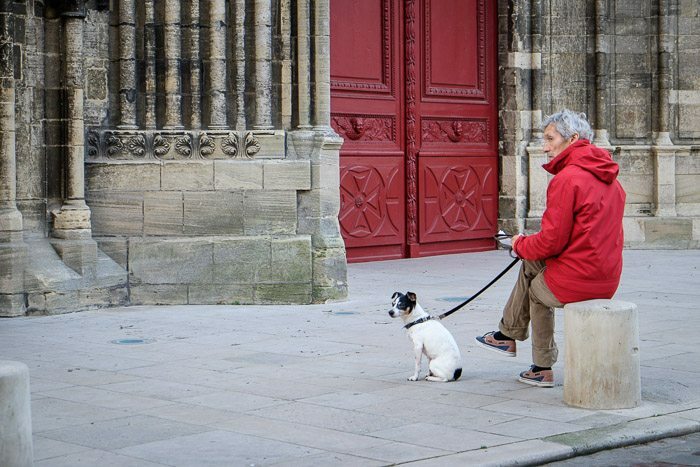 Dog waiting patiently for its owner to make an important decision. Here’s a photo I took while hanging out for an afternoon on the back patio of a Starbucks in Midtown Sacramento, CA. I shot this with my awesome little Canon Power Shot S120. I shot this with my Canon AE-1 while taking a walk on the beach in Carmel, CA. Owners taking their dogs out for a walk, or should I say, dogs taking their owners out for a walk. I shot this with my Canon AE-1. Saw this dog avoiding the feet of visitors to a Fort Concho Frontier Days event. I saw this at a dog exhibition, where they prepare the dogs for showtime. I saw this dog reaching up for a snack from across the street and had to run to get the photo. I nabbed this photo with my Leica M2 and Summaron 35mm on Ilford HP5+ film. Took this on a recent trip to Morocco. Saw three Italian Greyhound while I was photo walking by the Fraser River, Vancouver, BC, Canada last December. It was a cold day. What a dog fashion show! She was on leash, I have removed it using Lightroom. Close encounter with a bulldog at the ImportFest car show in 2014 in Vancouver, BC, Canada. He thought I was delicious??! Down by the river there’s a huge tag “DOGS”on this wall. It was only a question of time before a real dog came by. OK, yes, it is my dog. I went back and forth between the color and the black/white version, and finally chose the color. The color seems to add more than take away from the shot. Entries are now closed for this contest. Thank you for participating! Congratulations for your amazing photograph Thomas! I really like the result. Lovely image Achim! Well done! Thank you, Spyros. There are a lot of photographic oportunities at dog shows, so I typically spend some time to walk around and take photos.